This magnificent 3 bedroom, 3-bath condo is situated in Mountain Shadows, a private, gated community located on the Arnold-Palmer-managed Tahquitz Creek Public Golf Course, minutes from the airport and downtown Palm Springs! This condo is surrounded by friendly neighbors, lush green fairways, and amazing views of the San Jacinto Mountains. 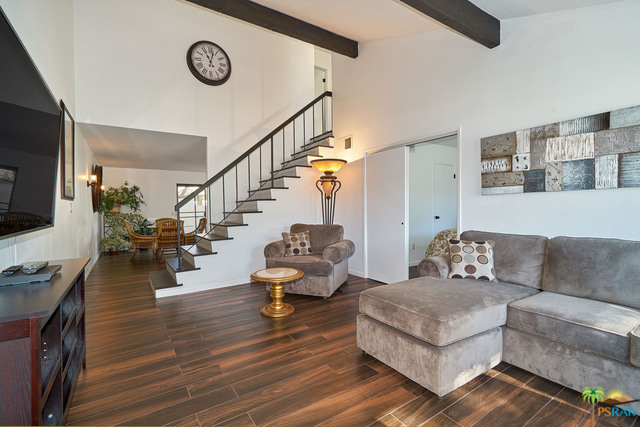 The two-story home welcomes you with beautiful porcelain tile flooring, beamed ceilings and amazing living spaces. The kitchen boasts ample space and outdoor access to the patio. The living room connects to the first guest room, or den, which has easy outdoor access to the large courtyard overlooking the fairway. The Master Suite is upstairs and boasts dual vanities, lavish stall shower and peek-a-boo mountain views. The third bedroom is adjacent to the master and it holds breathtaking views of the fairway and the mountains! Mountain Shadows amenities include 6 pools and a spa, 2 Tennis courts and onsite management!